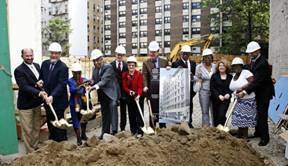 ShermanLaw represented the Harlem Congregations for Community Improvement (HCCI) when it decided to build a major new senior affordable housing development in the Bradhurst section in Harlem. Representation included securing mixed-financing and general corporate matters associated with the development. The Erbograph Apartments, developed in a partnership between HCCI and Jonathan Rose Companies, are designed for senior aging-in-place living, with handicap-accessibility for the residents. The development incorporates cutting edge LEED green sustainable standards, featuring terraces and a planted green roof for the residents. ShermanLaw negotiated and drafted the joint venture agreement, obtained HUD 202 senior housing financing, negotiated terms for Low Income Housing Tax Credit investment (LIHTC) with the syndicator and the limited partnership agreement and negotiated necessary waivers of HUD regulations in order to close on all sources of the mixed financing. Additional steps required finalizing American Recovery and Reinvestment Act of 2009 Tax Credit Assistance Program (TCAP) financing and obtaining additional financing from the Federal Home Loan Bank, Enterprise Green Communities, Home Depot, and New York State Energy Research and Development Authority (NYSERDA) grants. With ShermanLaw’s guidance, this 8-story, 62,000 square foot development added 65-units of affordable rental apartments for seniors, and restored an abandoned industrial site to community use. The property, an abandoned film storage warehouse known as the Erborgraph building, was previously designated as a contaminated brownfield area and required special studies and remediation. The groundbreaking ceremony for this project took place in the spring of 2010.